We’ll foof it up a bit in the morning. And this is Julie Herman of Jaybird Quilts fame (below). 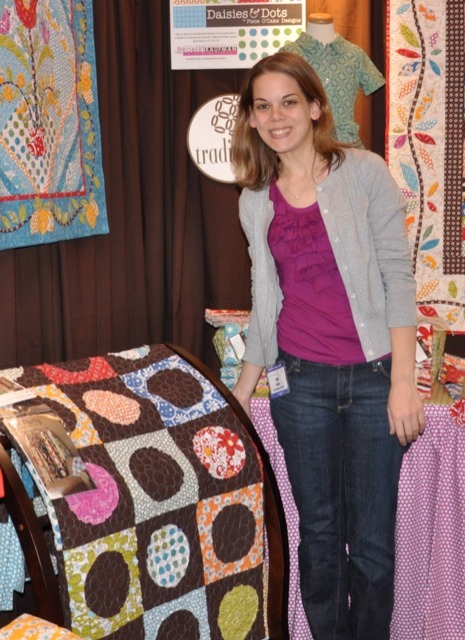 She made that cute quilt with circles that she is standing next to that she is graciously letting us show in our booth. She has a pattern for the quilt and I’ll you will see it if you check out her blog at http://www.jaybirdquilts.com/ . She also blogs for Robert Kaufman Fabrics and I think you’ll see us there soon! I’ll send more updates tomorrow. Oooooo – love the light blue quilt with the large red flowers! Must have!! How can we get the pattern? Looks so yummy; you should be selling cupcakes too! That is a version of The Ground from our book, Applique Outside the Lines, made up in the new Daisies and Dots fabric. I think well have a kit or yardage info on our site when the fabric comes in in January. Oh, LOVE those red chairs! All your things look just great there, plus Julie’s. It must be exciting to actually be there finally. Looks great I cant wait to see it tomorrow. Loved your presentation at school house today! It’s great to be around upbeat people. 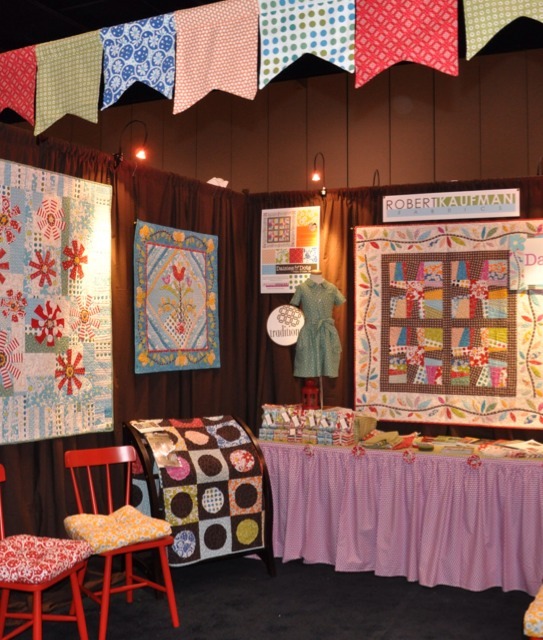 Love the booth and all the quilts…just can’t wait to get some of your yummy new fabric! Becky & Linda it was so great to meet you both this past weekend!! You are an amazing pair & I appreciate your support!! I was there for your Schoolhouse presentation and I couldn’t be more excited for your new line! It’s absolutely fantastic. Hello, love your new line of fabric. 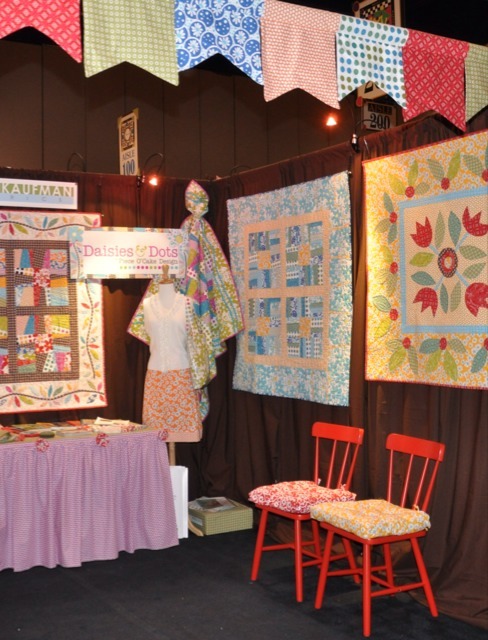 What is the name/pattern of the quilt to the left of the sign “Daisies & Dots.” It looks like a great stash buster. That is one of 3 quilts that will be available as a free pattern when the new fabric comes out. Youre right – is is a good stash buster!